The General Election is now less than 4 months away. Regardless of the outcome, one thing's for sure - the need to reduce the country’s deficit and do things in a more innovative way will remain a high priority for any government. As a civil service, we need to ensure that we are delivering public services as efficiently as possible. Effective leadership is essential to changing the culture of the Civil Service so that it can embrace the new ways of working that will help us to achieve this. That is why we have published a clear Leadership Statement setting out the behaviours that civil servants can expect of their leaders. 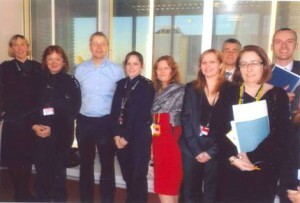 Last week, on a visit to Manchester, I saw at first-hand how the Manchester and Salford Better Business Compliance Partnership and Border Force and Immigration Enforcement commands are demonstrating just the sort of innovative, confident approach, open to new ideas, that the Leadership Statement is intended to encourage. I started the day by visiting the Manchester and Salford Better Business Compliance Partnership. This is one of 5 partnerships launched in October following some policy work on illegal working and the exploitation of migrant workers. This concluded that joint working between local and national agencies could be more systematic and that there was often a focus on malicious non-compliance rather than also supporting legitimate businesses to comply. 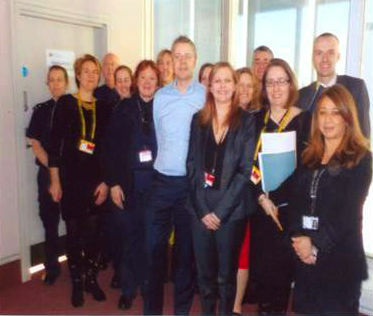 The pilot, taking place in Manchester and Salford is locally led with involvement from Manchester City Council, Salford City Council, Greater Manchester Police, HMRC, Home Office Immigration Enforcement and Greater Manchester Fire & Rescue Service. The team took me out to see how, in one area of the city, organised criminal gangs are using so-called legitimate businesses as a front for all sorts of illegal activity - from selling counterfeit goods to smuggling cigarettes. The fact that everyone is working together to tackle these problems is clearly paying off. I heard how, in November, these organisations worked together to target the facilitators of organised crime and tackle business non-compliance with regulation. Over 52 arrests were made, resulting in the recovery of counterfeit goods to the value of £5 million, £23,700 in cash, 1.2 million cigarettes, 71,300 non-duty-paid tobacco and £30,000-worth of cannabis plants. Another partnership week later this month will hopefully produce similar results. Witnessing for myself how the important work done by analysts in Whitehall is being put into practice in local areas was a real eye-opener. But these new ways of working are clearly taking hold, and I was reminded (as I always am when I get away from my desk) of the dedication and passion of civil servants, law enforcement officers and local government workers. Their dedication is having an impact on these complex problems: reducing illegal working, ensuring workers are being paid the national minimum wage, improving tax receipts and cutting the cost of compliance and enforcement activities to the taxpayer. My hope is that we can start to roll this out across the country. After a useful meeting with Howard Bernstein, Chief Executive on Manchester City Council, and the other Greater Manchester (GM) council leaders, to discuss the recent pathbreaking devolution agreement reached between GM and the Government, I spent the afternoon at Manchester Airport. There, I met officers responsible for safeguarding and trafficking matters in Border Force and Immigration Enforcement. The team was set up to ensure that there are sufficient specially trained staff available to deal with a potential victim of trafficking at the border. The excellent Border Force and Immigration Enforcement Officers I met are working with key external stakeholders - including Barnardos, Greater Manchester Police, Social Services and the National Crime Agency - to step up our efforts to combat this dreadful crime. The team told me that, in the last year alone, they had identified 45 potential victims of trafficking Since July, when the Manchester team became fully operational, there has been a 40% increase in the number of cases. It is truly shocking that this form of modern-day slavery is on the rise and makes the work of this multi-disciplinary team all the more important. I left Manchester feeling really positive about how civil servants across the country are confronting the challenge of becoming more efficient, more innovative and more joined-up as they continue their vital work. Seeing the Border Force team at the airport only reinforced my conviction that the work of civil servants is of national - and international - significance. There can be few greater responsibilities than protecting the most vulnerable in society, and it was hugely rewarding and moving to see the impact our teams are having on helping the victims of such appalling crimes as people trafficking. Thank you, to everyone involved in this thought-provoking visit - I am very grateful.